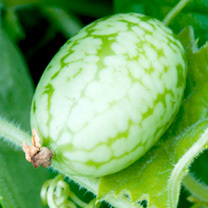 These unusual climbing/trailing plants are easy to grow up canes or trailing out of a basket, and will provide a good crop of unusual little fruits that look like tiny watermelons, and boast a flavour that is a unique combination of cucumber and lime. And they’ll keep fruiting all summer! The smallest and tastiest mini grape-sized 'cucumber'! Sow April-May. Harvest Year 1 July-September; year 2 June-September. Ideal for beds and borders, patio pots and containers, hanging baskets, climber.